Kassi Gulliford, an 18-year-old, fourth-year member of Spirit's horn line (she marched baritone in 2001 and euphonium from 2002 to the present), sent in this one. "Euphonium is my niche, I will march it to my age out in 2007," Gulliford said. 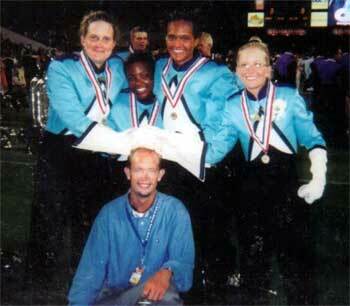 Here are the four girls from the 2003 baritone/euphonium line and our beloved visual tech, Steve. From left to right are baritone line members Janette and Connaka. Third from the left is me. On the far right is Kat, who has been on Spirit's baritone line for the last six years, finally aging out in 2003. Missing her is an understatement."